All the elements of this vignette are in a big, soft gold tray. There is enough room in the tray to all lots of pretty decor accents. I think corralling items in a tray looks neat and cohesive. I used candles to help bring some of the aqua into the vignette. They are an inexpensive way to add color! I also painted an old chippy, white candlestick “duck egg blue”. I often say, “A paintbrush is like a magic wand”. Other than the new aqua candles I used what I had around the house. 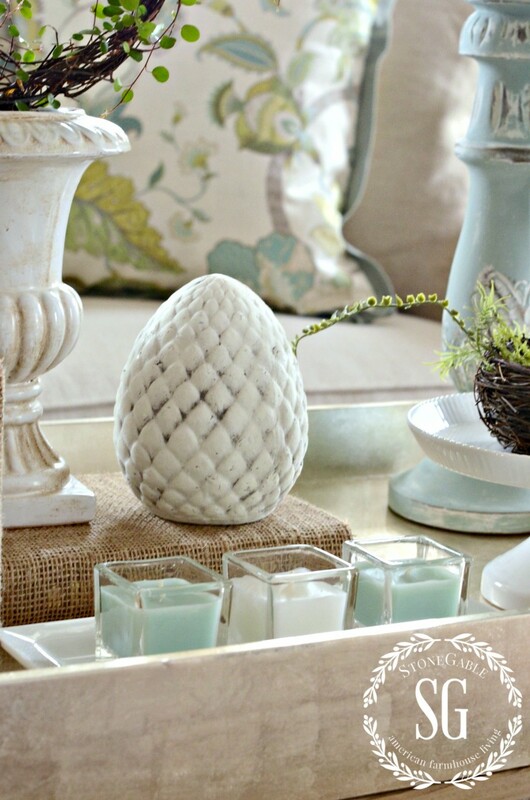 I love to “shop my house” for vignettes! I’s amazing what you have that work well together! …and my favorite wire plant. I have killed two and got another. Hope springs eternal! I did find out that wire plants like to be wet. I hope I can keep this one alive! So far it’s thriving! 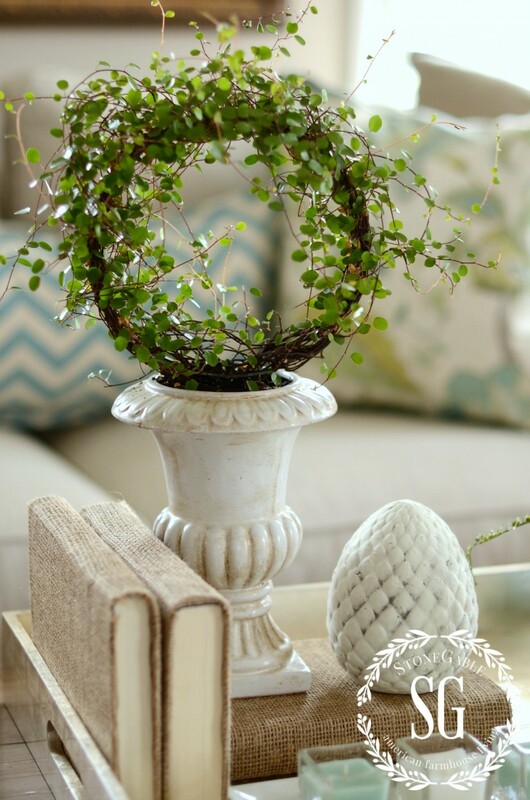 Lastly, a little nest with aqua eggs fits on a small white pedestal. Did you notice my spring pillows? I bought the square ones from Ballard. 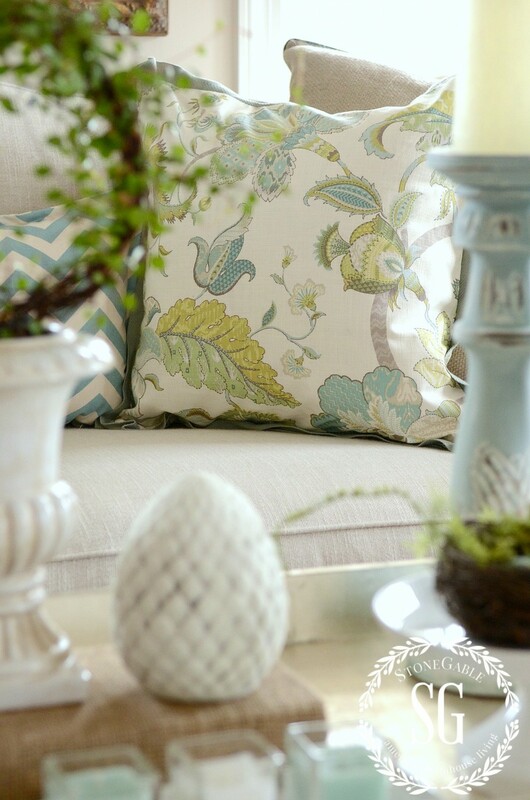 They have traditional styling and use the colors in my living room plus a good dose of various hues of aqua. The long center aqua and white chevron pillow came from HomeGoods and brings a little bit of trendy styling to the room! Although the patterns are so different, they work together! 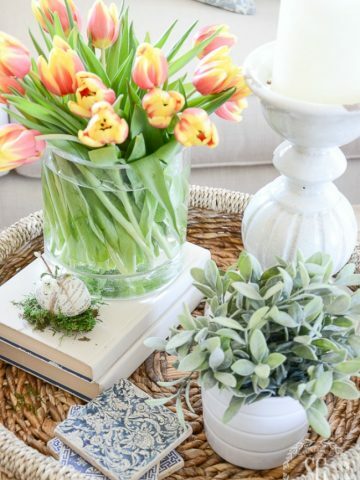 Styling a coffee table vignette for spring brings a breath of fresh air to my whole living room! I’ll show you more next week! 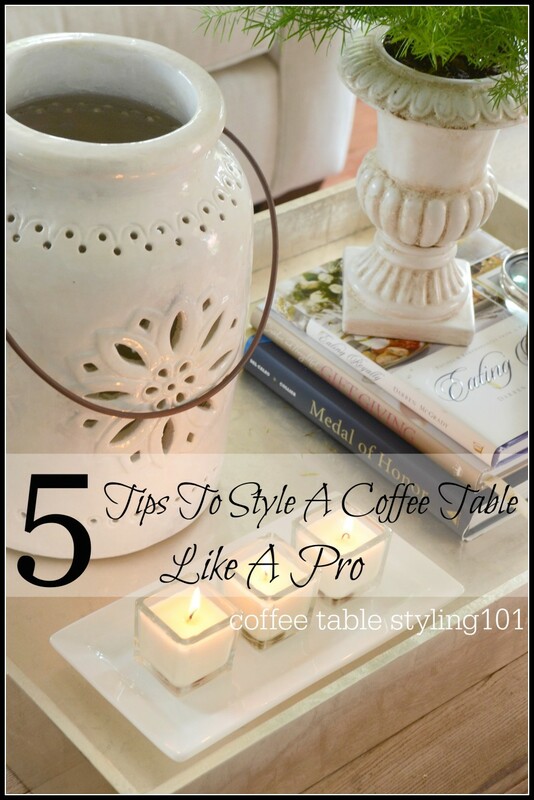 If you would like to learn how to style a coffee table like a pro click HERE. Remember to pin this to your Pinterest DECOR or VIGNETTE board. 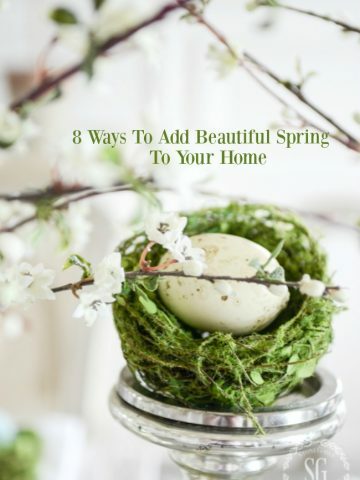 You can follow me on Pinterest and see all the spring decor I’m finding HERE. Happy Spring Yvonne, YOU just do the most beautiful arrangements, thank you ! Love the soft aqua! Very soft and pretty. The plant is a hard one to keep indoors. If it starts to die take it outdoors in the shade. Makes a good ground cover too. I am going to miss the Scoop so much. So many good ideas and information plus the beautiful pictures. I love looking through it! I love this post!!!! The vignette is simple in a good way and so welcoming to friends and family. 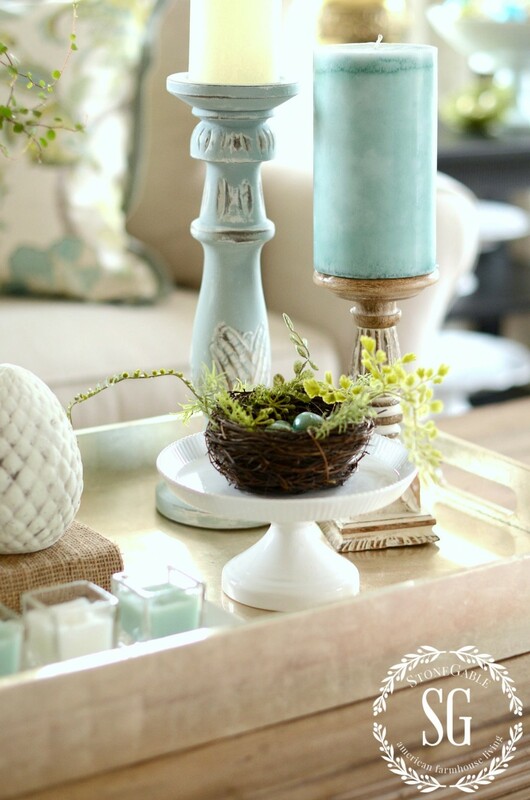 I love the aqua color candle and the painted candlestick. My colors are aqua and coral. I just love reading your blog posts and trying to replicate them. You are so talented and so good at what you do for us!!!! Thanks so much and look forward to reading more for the spring!!!!! Very pretty, light and airy, just says spring. I am loving that aqua color for spring! My eye went right to your pillows. I have a pillow problem ?. 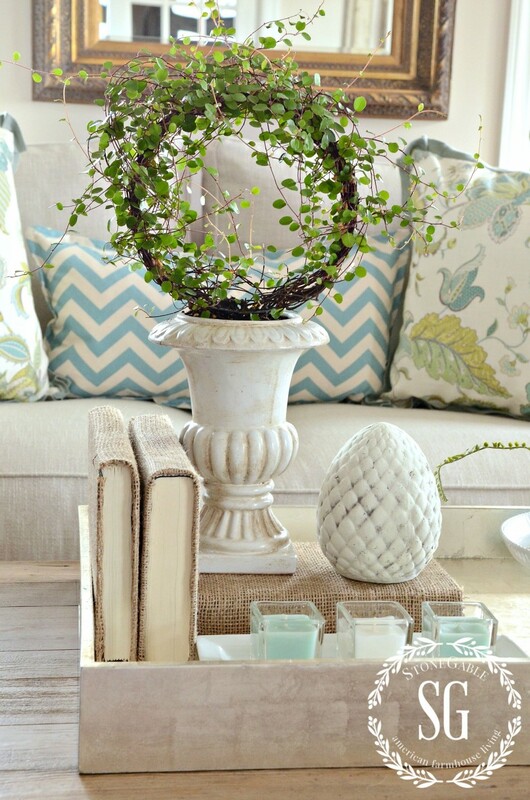 Love your tips on creating a coffee table. I have a round table and it is so hard to figure out what would look nice and fitting. Love the coloring of your Spring home. Very pretty. I love this shade of blue that you’ve used – gorgeous with the brown!!! Blue and caramel and white are really so pretty together! I’m glad you see that too! I have had trouble with square votive candles burning without the wax flooding out the flame. Do you have a brand you like to use? BTW – I love all that you do! Thank you for sharing! You do some of the prettiestvignettes on any blog. I love the artichoke and the wreath topiary. I also like that you use books a lot in your vignettes. I covered some in fabrics that contain the colors in my living room and set a teapot full of daffs on top of them. You are truly a decorating inspiration – and a Christian. Praise be to God for this glorious Easter day! Lovely! May I ask where you found the serving tray pictured? It’s exactly what I’ve been looking for. Thank you! Hi Sarah, The serving tray came from Pottery Barn Outlet. I’ve seen it lately so you might want to check to see if they have it on-line. I just love these fresh colors!! Can you tell us where you got the pillows on the couch? 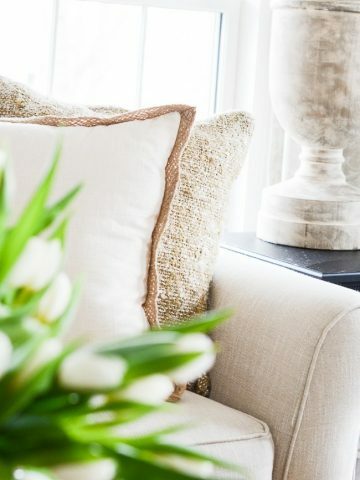 The pillows came from Ballard Design! Love the touches of aqua you brought in, Yvonne! That little topiary is so pretty and cute in the urn. You make me want to go out and buy a real plant for the house! I kept it alive until summertime and then it bit the dust! I went to the same greenhouse this spring and so far, they don’t have any! I’m gonna keep looking because I love the “wire -y” look! Wow! I love the fresh, soft color pallet. Looks like a completely different room. 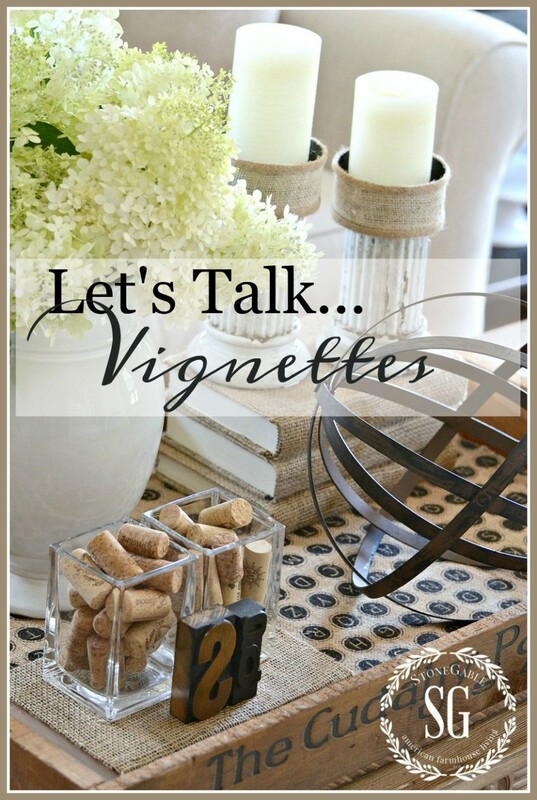 I have been using your advise for table vignettes & your blog is so inspirational! I was wondering, where did you get your coffee table? I love it! The table came from Ethan Allen. So pretty! I love the pale turquoise! Very pretty Yvonne…I love angel vine! So lovely, Yvonne! I use the same colors for spring after Easter. Don’t you just love them? They make me want to take a deep breath and sigh with joy. I Love love the pillows! You have brought some sweetness to our cool Eastern Carolina day! Thank you. Thanks also for sharing your purchase sources! Have a week filled with JOY! Gorgeous Yvonne….I am so loving the colors!! !…Another magnificent vignette!….Happy Spring! I would love to know where to purchase some of the dishes you have in your table settings. 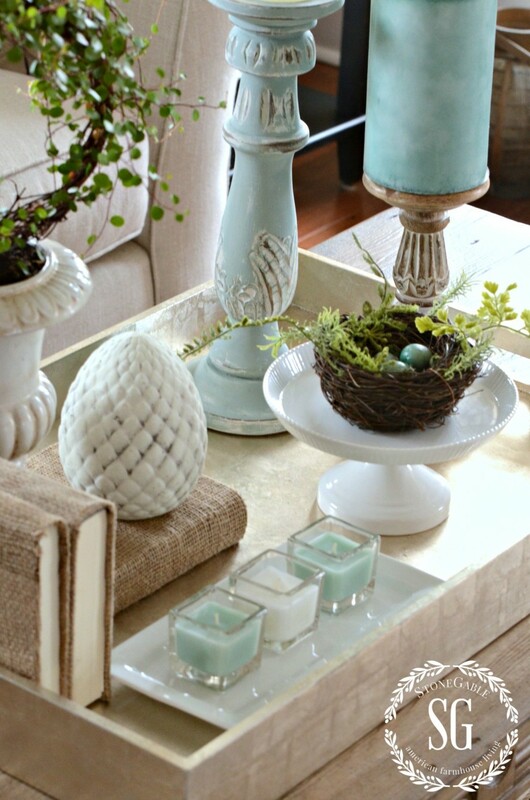 Love your Spring touches and the addition of the beautiful aqua! You do everything with grace and class. Looks beautiful! 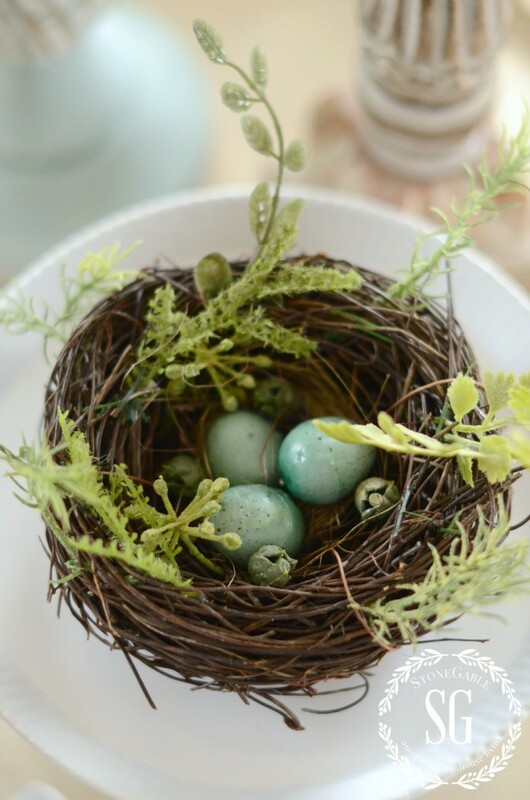 The nest and eggs are beautiful! Going to look for one. Thanks for the great ideas. So enjoying the idea for the kitchen. Beautiful…I love Spring and your aqua colors are my favorite!! Yvonne, love the spring colors. Could you share where you got the wire plant? Thank you. I got the wire plant at a local Greenhouse called Stauffers of Kissel Hill. Lovely and the Home Goods pillow is beautiful. Happy Spring! So beautiful Yvonne, I love the colors you chose and all of the Spring touches! The plant is so pretty too, I need to find one of those! Pretty colors, Yvonne. The first thing I noticed was the pillows. I love your soft color choices. It looks like spring! The pillow pulls all the colors together. Beautiful! I just found your blog, and I am in love with it! I also read your account if your finding Jesus’ tomb,which made me love you more because we are sisters in Christ! I have signed up for emails and am now a follower on Pinterest. I look forward to following you,and I encourage you to continue to share your faith. We love it! Hi Mimi! Welcome to the StoneGable family!